Hingham became the first Massachusetts team to beat powerful Lincoln-Sudbury in over 1,400 days. Before yesterday, the Lincoln-Sudbury boys' lacrosse team hadn’t lost a game to a team from Massachusetts in 1,411 days, a streak that stretched 57 games and three Division 1 state championships. That streak was snapped Saturday, as the Hingham Harbormen scored the only two goals of the fourth quarter to defeat the Warriors, 6-4, in the semifinals of the Coaches Cup at Andover High School. It was Hingham’s first win over Lincoln-Sudbury since 2011. The Warriors had won the previous three meetings. The Harbormen won on the back of their defense. L-S fired 33 shots, but only 14 made it on cage. That was due to Hingham’s poles pressing smartly and sliding well from start to finish. Hingham held the Warriors scoreless for the final 22:08 of the game. When the ball did make it to cage, sophomore goalie George Egan was up to the task. Egan turned aside 10 Lincoln-Sudbury shots, including three in the final period. Despite the game being tied at two, three, and four, the Harbormen never trailed. 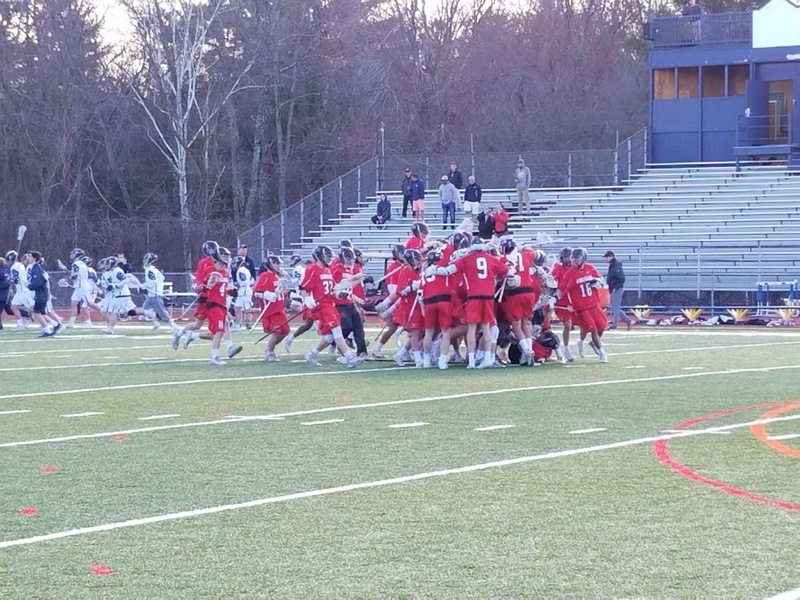 Tommy Welch scored 19 seconds into the game to set the tone, and Hingham kept up that tempo throughout. Hingham also dominated the hustle plays, winning faceoffs 12-2 and ground balls 26-17. Six players scored for the Harbormen. Junior Matt Ward had a pair of goals for the Warriors, but L-S couldn’t find a consistent rhythm offensively. The Warriors rang the post four times, including twice in the fourth. Earlier in the day in the first Coaches Cup semifinal, the North Andover Scarlet Knights came back from an early 3-0 hole to defeat Winchester 10-6. The Knights gave up the first three goals of the game but cruised past the Sachems in the second half thanks to a six-goal third quarter. Down 4-2 early in the third, the Knights rattled off five straight to take a 7-4 lead and never looked back. North Andover was led by a hat trick from Steve Ferullo. Ferullo’s third goal, eight minutes into the third quarter, put the Knights ahead for good. Winchester was led offensively by two goals from senior attackman Jack Carpini and a goal and an assist from sophomore middie Grant Murray. Roche had a pair of goals for the Knights and fellow senior Zach Keating added a pair as well. Jack Chance had a pair of assists. In total, six Knights registered a point. After shooting 18 percent in the first half the Knights figured out the Winchester defense and shot 47 percent from the field after intermission. The Sachems had no response for the Knights.